On October 28, 2016, thirty young people from member countries of the Association of Southeast Asian Nations (ASEAN) visited Shinshu University and participated in an inter-student exchange event at the International Center for Science and Innovation at Shinshu University (AICS) with students of the University's Faculty of Engineering. This was carried out as part of the Ship for South East Asian Youth Program (SSEAYP), a Japanese Cabinet Office international youth exchange program. 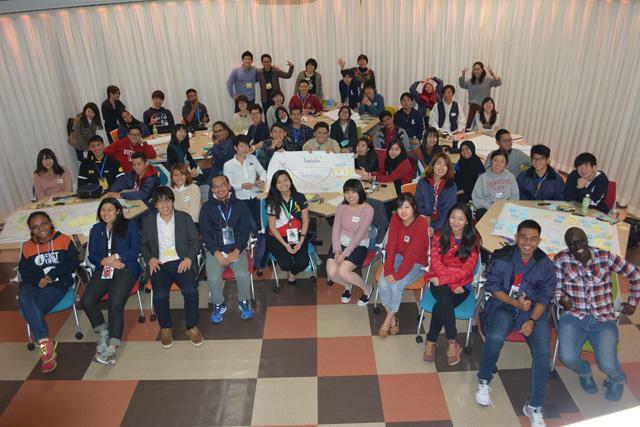 The exchange event was planned independently by Nagano International Youth Exchange Organization (Nagano IYEO) members, a group comprising former SSEAYP participants, and it represents the first such exchange session between SSEAYP participants and Shinshu University students. Youth from the 10 ASEAN countries of Brunei, Cambodia, Indonesia, Laos, Malaysia, Myanmar (Burma), the Philippines, Singapore, Thailand and Vietnam participate in SSEAYP. During the program, they live together in Japan, on the boat and in areas near the ports they visit, engaging in various exchange activities as they go. Intended to provide opportunities for participants to share opinions, better understand each others' histories and cultures, and deepen their bonds of friendship, these exchanges between young people living in various parts of Japan and young people from different parts of Southeast Asia involve homestays, visits to sightseeing spots and other activities in Japan. This latest visit, from October 27 to 31, was the first by the organization to Nagano Prefecture in three years. The Shinshu University Faculty of Engineering Executive Committee, which is made up of student volunteers, gave a warm reception to visiting students on October 28, and held discussions revolving around locally produced food products as well as a food-tasting party and more.